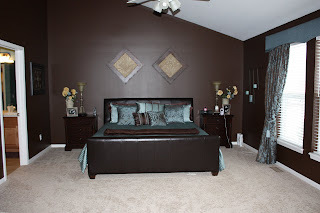 In my last post, a few of you readers noticed our bedroom and made comments about it. So, that gave me an idea for a new post. I wanted to post some better pictures of it. It is probably my favorite room in this house and one of my favorites out of all 3 houses we've remodeled and/or decorated. I love the blue and brown that seems to be so popular now. I didn't really know I liked it until I found our bedding. I found it a Z Gallerie which is one of my favorite stores. They have a great mix of stuff and the prices aren't too bad. I got this bedding on sale which made it even better. We are the second owners of our house and when we moved in, the bedroom and bath were still the "builder white" that was here originally. I wanted to paint it immediately but there were other more pressing painting projects to complete. We finally got to our bedroom about 7 months after we moved in (when I was 6 months pregnant). 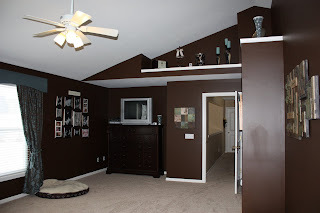 I chose to paint the walls brown. 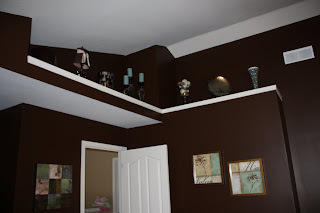 I was a bit scared to at first but I knew that since it was a big room that it would be okay to do a dark color. 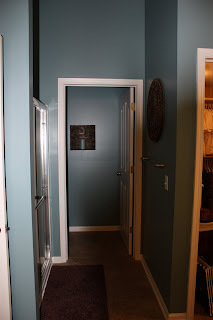 I absolutely love how it turned out...but I do not love that it took a coat of primer and 3 coats of paint. UGH! I ordered all the fabric online after searching and searching. My mom made the curtains and the accent pillows on our bed because well, she's an awesome sewer and I am not. She also helped me hang all the pictures and such on the walls because I'm not great at that either. So, here it is....our bedroom. Just for fun, here is a before picture. 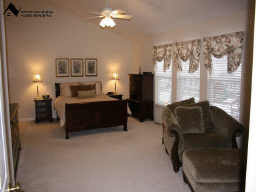 This is what the bedroom looked like when the former owner's lived here. It was in the brochure that we saw on the house. The bed is from Overstock, nightstands from Costco and most accessories are from Kirkland's which is also one of my favorite stores! 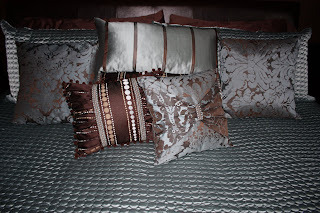 Close-up of the fabulous pillows my mom made....thanks mom! This is the view from the other direction...notice we have another Julianne shrine wall. What is a room in our house without a shrine to our girl? Oh, and the next thing on my list to buy for the house is a new ceiling fan for our room. The white one DOES NOT GO!!!!!! This is the bathroom. Notice the gigantic tub with NO jets.....who gets a tub that big with no jets? I miss having a jacuzzi tub. "my side" of the bathroom. If we were staying here for a long time, we would restain the cabinets and put granite on the counter tops. We settled for some paint and tiling the floor. The shower area is on the left area of this picture. I didn't take a close-up because I hate the shower doors. New ones are on my wish list. So there you have it. This is kind of fun. Maybe I will do some more decorating posts. I hope you enjoyed! It looks great! 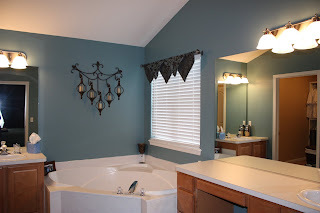 I love the blue and brown, it is pretty and romantic looking. Okay, and seriously, I hate how many coats dark colors take! I even buy the expensive paint that is thicker when I do a dark wall... but I just have to keep painting and painting and painting. It is so frustrating!!! Yours looks awesome though! It looks great! I love the brown and blue color scheme right now. 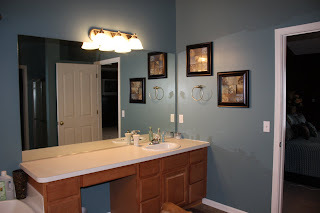 I was doing brown and green for a while... but once me moved into our current home about a year and a half ago, I started to drop the green and add blue. Its still a work in progress. You guys have a beautiful home! Man I should have stuck with becoming a doctor.